study in Davao City and earn Australian Qualifications and American Hospitality Certifications which are both recognized and accredited worldwide. Workskills Australia are professional consultants in Vocational Education, Management, Training &amp; Skills Accreditation to the Tourism, Hospitality &amp; Food Service industries. 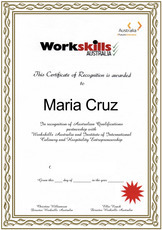 Workskills Australia specialise in the development of training programs &amp; courses that are fully accredited within the Australian Qualifications Framework for workers studying for or working in industry. 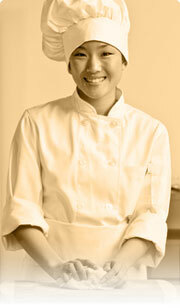 delivers comprehensive programs designed specifically for the hospitality industry. AHA’s mission is to provide tomorrow&#39;s hospitality industry leaders with the knowledge, practical training, leadership and multicultural skills necessary to succeed in today&#39;s global economy while fostering international goodwill and friendship. 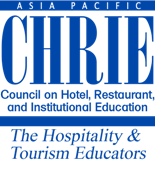 International CHRIE (ICHRIE), a non-profit professional association, provides programs and services tocontinually improve the quality of global education, research, service and business operations in thehospitality and tourism industry. ICHRIE, an inclusive, collegial association, values creative, ethical and progressive action and improvement of global hospitality and tourism education and research. as APacCHRIE, is a Federation of the I-CHRIE. Members of APacCHRIE constitute all countries on the Pacific Rim who must also be a registered member of I-CHRIE. International Certifications from our Global Education Partners are awarded to all our students who will successfully complete a series of examinations. This course is integrated in all of our baccalaureate degree programs at no additional fees to our students. 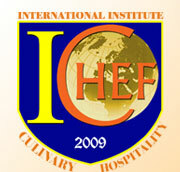 ICHEF is the only school in Davao and Mindanao that offers all its students the chance to get multiple international certifications. Upon graduation, students receive more than one international certification. What are the benefits of International Certifications? These certifications enrich the student’s academic preparedness to take advantage of the multitude of global employment opportunities and challenges awaiting them. The International Certificates substantiates a student’s acquisition of knowledge and perspective in the varying aspects of our ever-evolving global economy. These enhances the student’s ability to communicate and engage in the international hospitality and tourism arena with greater confidence taking into account the diverse commerce, cultural and social environment . 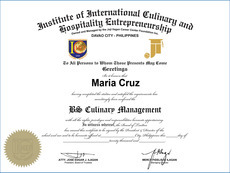 These certificates provide an international passport to global recognition and worldwide access to work opportunities. What Certificates will the students receive upon graduation? 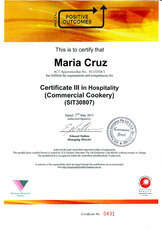 The Hospitality Professional Certificate (HPC) have been created for students and hospitality professionals. No matter what your level of education or extent of your work experience, there is always more you can learn and strive for, that will benefit your professional career. 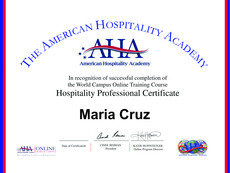 AHA's hospitality professional seminars emphasize the development of both personal and professional leadership traits needed to be successful in the hospitality industry, regardless of your position.